It’s nearly porridge season, and if you’re like me and tend to get stuck in breakfast ruts for months on end, you need this Overnight Oats recipe in your life! It’s very easy and takes minutes to make the night before. It’s sugar free (minus the fruit), and oats are a slow-releasing carbohydrate so keep your energy levels up all morning. 1 cup dairy-free milk – Coconut, almond and hazelnut are my favourites! Add the blueberries, milk, cinnamon and banana to a blender and blend for about 30 seconds. Pour the mixture into a jar and stir in the oats and chia seeds. Pop the lid on top then leave in the fridge overnight to let the oats & chia seeds soak up the liquid and expand. The chia seeds are optional with this recipe, but are a bonus addition as they’re really good for you and also go gel-like in liquid making this breakfast seem more like a pudding than just y’know… a bowl of cold porridge. You need to have roughly double the amount of liquid as oats, to avoid the final result being too liquid-based or stodgy. In the morning feel free to use whatever toppings you like to make it all the more enjoyable. At the moment I’m loving strawberries, kiwi, figs, cacao nibs and hazelnuts. In the pic above I sprinkled some extra chia seeds on top for even more goodness! 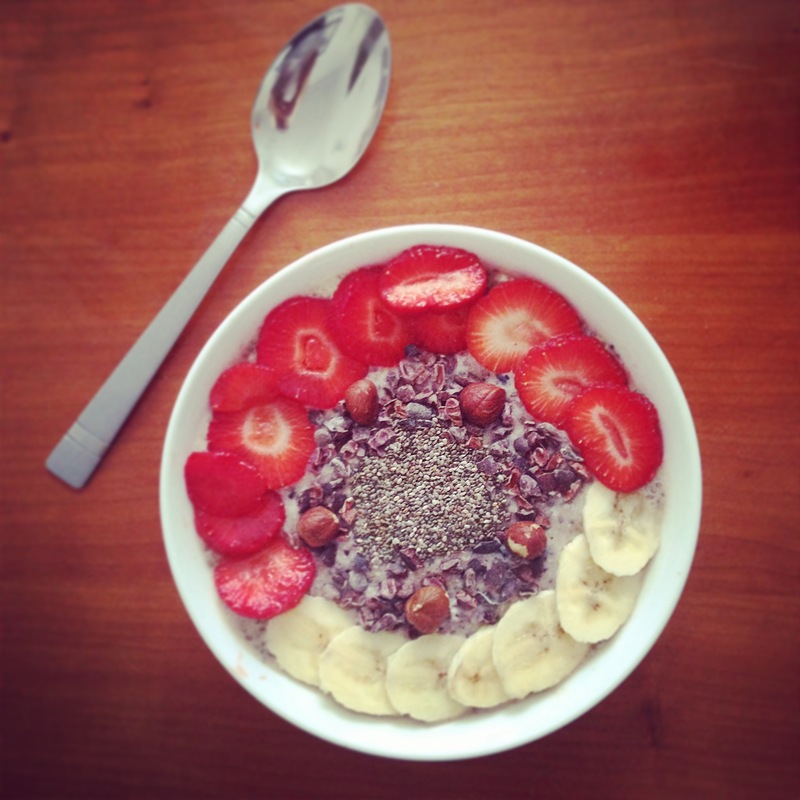 How do you eat your oats in the morning? Tell me in the comments below!